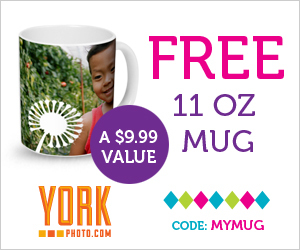 Through Aug 3rd, York Photo is offering up a FREE Photo Mug! These normally cost $9.99, but for a couple days you can get yours for just the cost of shipping! Just use code MYMUG at checkout. These make great gifts for just about anyone. Perfect back to school gift for teacher. Upload a picture of your child or even of the school. Or just pick one of their great designs with just text! Shipping is about $5.99, but still a great deal for this custom photo mug! So get your ordered today before this FREE Photo Mug deal is gone!